Ghana is definitely working again under the leadership of His Excellency Nana Addo, just yesterday, the 5th of December 2018, the President donated his November salary to the " Korle-Bu Accident Centre and Burns Unit ", the President made the donation on Wednesday when he commissioned a new facility for the National Reconstructive Plastic Surgery and Burns Centre (NRPSBC), on day 2 of his 3-day tour of the Greater Accr Region, again the President hinted that his administration is working towards making Senior High School (SHS) Education Compulsory. These are the things external branches are supposed to be trumpeting across the world for people to see what the Npp Government is doing, but not infighting about a lost election, elections always produces a Winner and ultimately a Loser, losing today doesn't mean the apocalyptic, you can always come back and win, Nana Addo is a great reference. Much as you may dislike the current Npp Germany Branch National Chairman Rev Alex Acheampong, he is your Chairman till God's Grace 2022 when new elections will be held, Ndc Ghanaians doesn't accept Nana Addo as their President but has accepted the fact that he is the President and as such has to put up with him till new elections, there can ONLY BE ONE CHAIRMAN at a time and the Chairman who is recognised by the NPP headquarters in Ghana is Rev Alex Acheampong. There is this video which has gone viral on the internet about our past Deputy Organiser Comrade Omama Yeboah entreating the government to see if something could be done to bring about a reduction in the duties paid on goods and vehicles imported into the country, he said this when Hon Michael Omari Wadie, our 3rd Vice Chairman came to Freiburg Germany to grace the Inauguration of the NPP Freiburg Chapter, as a democratic party which believes in the Rule of Law and the Universal Right of every human, former Deputy Organiser of the Germany NPP Branch has every right to pour his heart out, the leadership of the Germany Npp Branch led by our Dear Chairman Rev Alex Acheampong has no hand in what he said, he has EVERY RIGHT though to say what he said and I can assure you that the Npp government been a listening government will look into his pronouncements and see how best it can straighten things out for the entire nation to benefit from it. 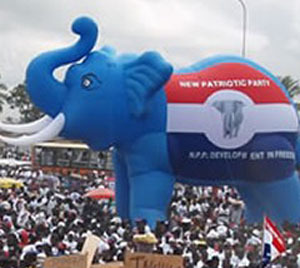 There's absolutely no confusion or an emminent disintegration of Npp Germany Branch, we are clued together like a leech to the Elephant Fraternity and working assiduously to WIN 2020 God's Grace for the President Nana Addo and the NPP, the BATTLE IS STILL THE LORD'S. Below is the link to the the video, please watch and hear the contents yourself.